Today I read an article about 32red releasing a personalized slot this year. This got me interested so I went to their website to try out some games. Boy did I get frustrated when I got the following error message “Unsupported browser detected“. I got this when I tried it with the Safari browser. So I thought “I’ll give it a try with Firefox insted”. So I did. 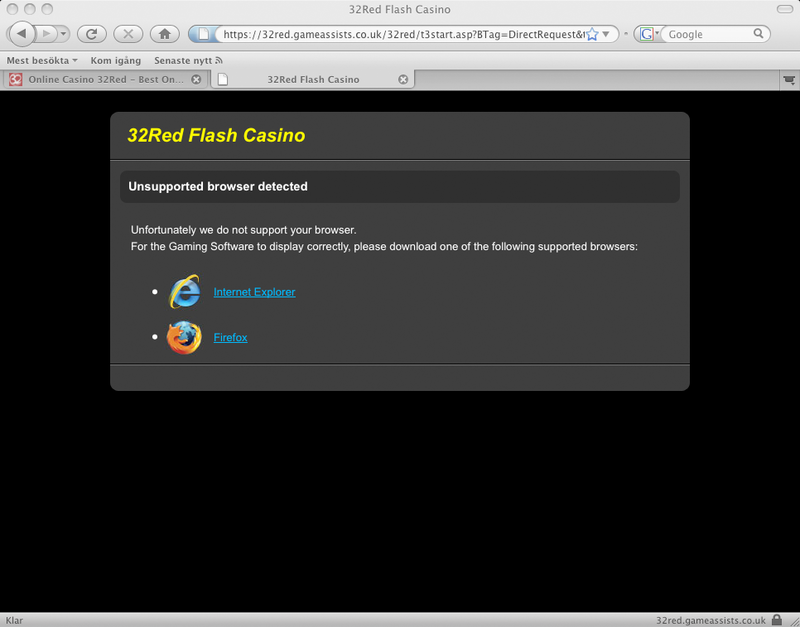 And to my big surprise I got the same error message when I tried to start a flash game on 32red. Why didn’t Safari or Firefox work? Both uses the latest Flash version so it shouldn’t be a problem. Making a restrictions for the player on which browser to use will just loose customers that can’t play there games. 32red use Microgaming as their supplier of Flash games and so does Ladbrokes. The difference was that on Ladbrokes website it worked to play the games with the Safari browser. So a much better solution would be to let the player play the Flash games with any browser supported by Adobe Flash and not make their own restrictions!